Veteran journalists Linda Carroll and David Rosner have been named joint recipients of the 13th annual Dr. Tony Ryan Book Award, presented by Castleton Lyons. The winners were announced at an evening reception on April 10th in the Ryan family's historic Castleton Lyons stallion barn, near Lexington, Ky.
Carroll and Rosner won for Out of the Clouds, The Unlikely Horseman and the Unwanted Colt Who Conquered the Sport of Kings, which chronicles the Cinderella tale of legendary trainer Hirsch Jacobs and the gritty “people's horse,” Stymie, as they ascended from obscurity to fame and glory during the 1940s — while also serving up a slice of America's own story. 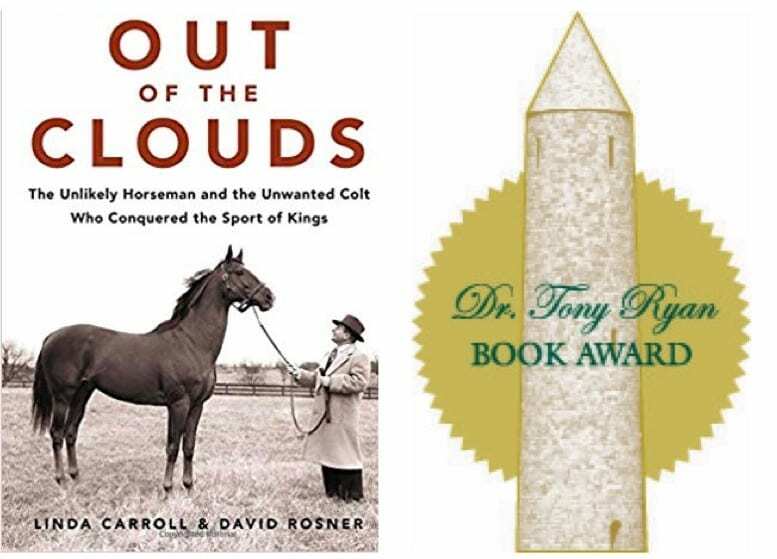 Since its publication last spring, Out of the Clouds has been an Amazon.com bestseller in the categories of sports biographies, sports histories, and horses. Linda Carroll has had bylines in The New York Times and Today.com, and in 2013 won the prestigious Peabody Award for her work on an NBCnews.com series on poverty. David Rosner, who began his career as a reporter for Newsday, has collected multiple Associated Press awards for investigative reporting and sports writing. The authors previously teamed to write The Concussion Crisis, Anatomy of a Silent Epidemic (2011) about traumatic brain injuries in sports; and Duel for the Crown: Affirmed, Alydar, and Racing's Greatest Rivalry (2014). As winners of the 2018 Dr. Tony Ryan Book Award, Carroll and Rosner received a check for $10,000, along with a Tipperary crystal trophy in the shape of Castleton Lyons' iconic stone tower. Other finalists for 2018 were: Dixie Luck, a collection of short stories and a novella by previous Book Award winner Andy Plattner; and Around Kentucky With the Bug!, a father's journal of his son's first year as a jockey, by Patrick Lawrence Gilligan. Each received $1,000 and a smaller version of the winner's trophy. The competition was launched in 2006 by the late Dr. Tony Ryan, to recognize the best in book-length writing about horse racing. Past winners have included a recipient of the National Book Award, and several Eclipse Award-winning writers. Since Dr. Ryan's passing in 2007, his son Shane has carried on with the award to honor his memory. Submissions for the 2019 Dr. Tony Ryan Award must be received by December 31, 2019. For further information on rules and guidelines, contact Betsy Hager at (859) 455-9222, or at [email protected]. This entry was posted in People and tagged castleton lyons, Caton Bredar, dr. tony ryan book award, hirsch jacobs, Jayne Moore Waldrop, Kay Coyte, linda carroll and david rosner, out of the clouds, stymie by Press Release. Bookmark the permalink.